The city of Merced lies in the San Joaquin Valley, along Highway 99 in central California. Merced prides itself as being the gateway to Yosemite National Park, which is accessible by California State Route 140. The city's population is presently about 80,000. Downtown maintains much of its character while development has sprawled to the north. This growth is reflected in the location of postal units in the community. Here are maps of Merced within central California as well as a postal map of the community. The Federal Building in Merced, managed by the General Services Adminstration (GSA), formerly served as the main post office for the city. 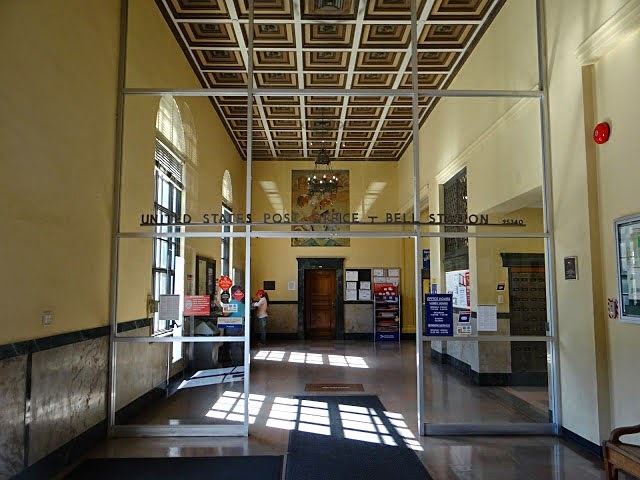 Fortunately the GSA publishes information about the historic buildings it manages, and has this to say about the architecture what now houses the T. V. Bell Station post office in addition to a few federal offices. 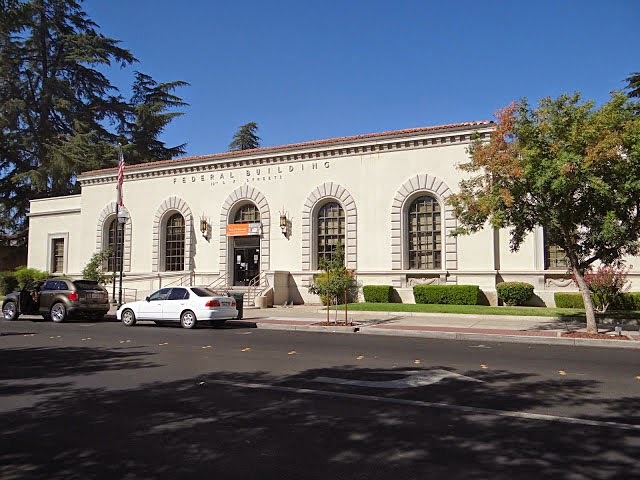 The Merced Federal Building and Post Office is an example of academic Classisism, tempered by a more vernacular Mediterranean influence. It is classical in the bilateral symmetry of its facades and its reliance on the Classical hierarchy of base, shaft, and capital in its vertical organization. Classical decorative elements include the round-headed arches, surrounded by voussoirs, molded terra cotta panels with swag motifs below the principal windows, and a cornice with terra cotta modillions surrounding the main body of the structure. Other, more vernacular, Mediterranean influences include the "Mission" clay tile hipped foor over the main portion of the building, the plain stucco wall surfaces, and relative simplicity of the facades' organization. From this interior view you can see one of the two New Deal-sponsored tempera paintings which hang in opposite ends of the building's lobby. 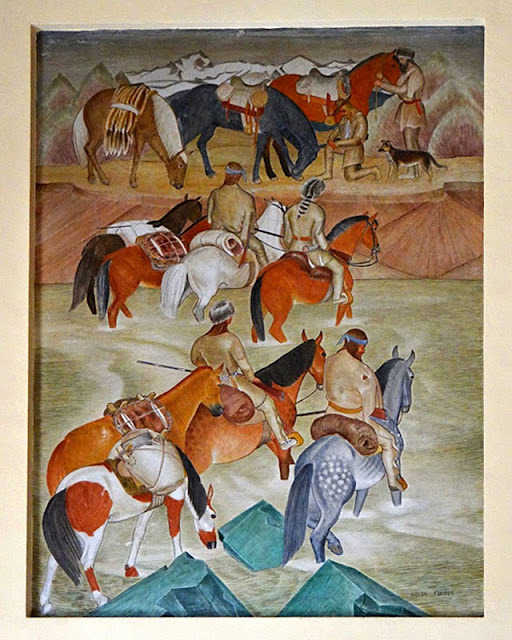 The murals (information courtesy WPAMurals.com) are "Early Settlers" by Helen Forbes and "Vacheros" by Dorothy Puccinelli. 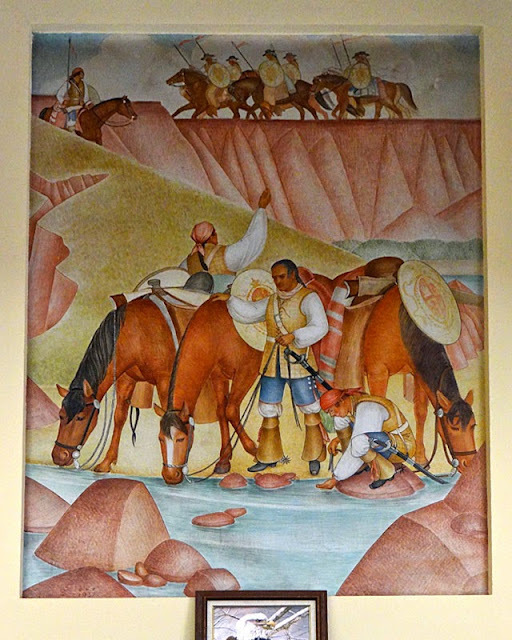 Both were painted in 1937. This is also reputedly the first post office to be named by act of Congress after a postal employee. Thomas V. Bell served as a postal employee in Merced for nearly 50 years, serving as Acting Postmaster from June 30, 1964 to the end of 1965. 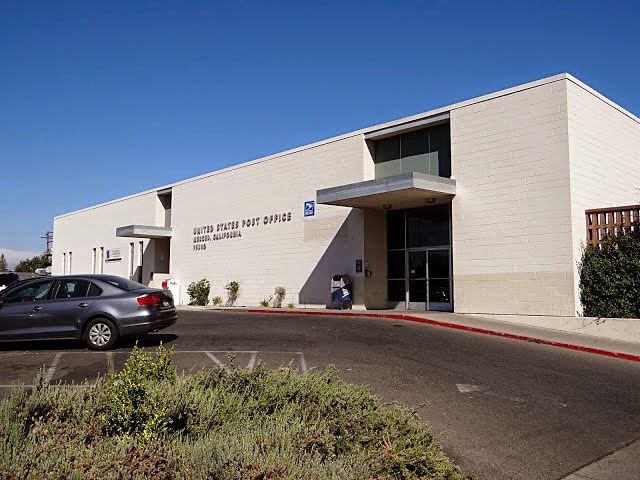 The then-Post Office Department transferred custody of the Federal Building in Merced to the GSA upon completion of its new Main Post Office facility, 0.6 miles away, in 1965. Development to the north of downtown necessitated the establishment of an additional postal outlet. 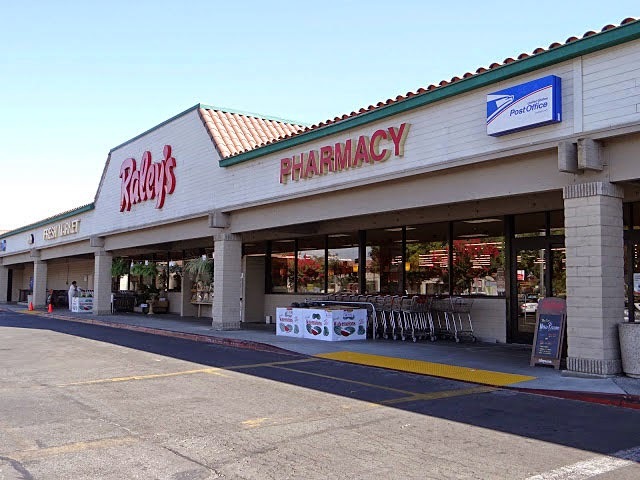 Currently the area is served by a Contract Postal Unit (CPU) at a Raley's supermarket. Many of the regional chain's 139 stores house CPUs.